The Haitian American Historical Society celebrated the 5th Anniversary of the Haitian Memorial Monument erected in Savannah Georgia on Oct. 8 2007. This year’s Historical Getaway began on Friday, Oct. 5 through Sunday, Oct. 7, 2012. The Haitian unit of Soldiers fought valorously on Oct. 9, 1779 alongside the French with the Allied American troupes and helped saved the day at the Siege of Savannah Battle. reception, diner gala, parade and city tour etc. 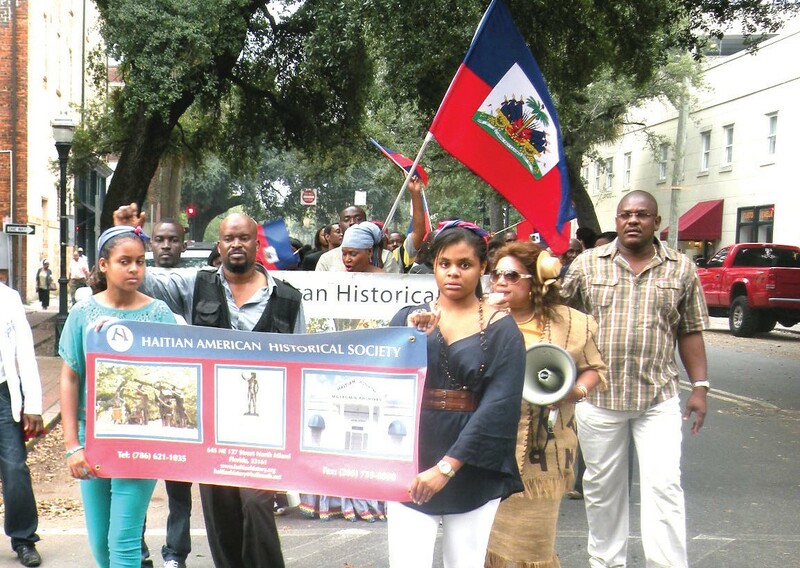 The Haitian American Historical Society (HAHS) is a nonprofit organization dedicated to fully investigating and marking any past instances where Haitian contributions have been identified. The organization seeks to establish truth and accuracy in historical events pertaining to Haitian heritage. One of the major goals of HAHS was to erect a monument in Savannah, Georgia to honor our forefathers, “Les Chasseurs Volontaires de Saint- Domingue,” a platoon of Haitian soldiers who fought for American Independence at the Siege of Savannnah in 1779. The monument was implemented into two phases by renowned sculptor James Mastin. Phase I consists of three greater than life size statues representing Chasseurs-Volontaires, including the 12 year old drummer boy Henri Christophe. For more info call (786) 412 1014, 786-621- 0035, 786-597-6100, Fax: 305-759-0800 www.haitianhistory.org email haitianhistory@bellsouth.net .